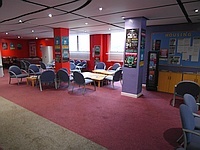 Services / facilities within the building include the Barony Bar, Gameszone - Pool Bar, Shop at the Union, The Scene - Cafe, Ash - Advice and Support Services, The Lounge - Social Space, Debates Chambers, Liberation Rooms, Postgraduate Lounge, The Priory - Cafe Bar, Vertigo - Bar and Venue, Meeting Rooms, SU Offices, NatWest Bank. You are on Parking (John Street). Skip to the next section. 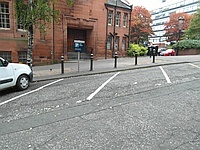 The car park has raised bollards. 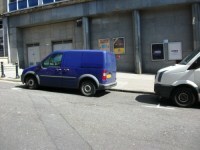 There is a dropped kerb/non stepped access from the car park to the venue. 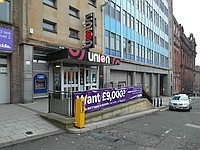 There are also on street pay and display parking bays on John Street. 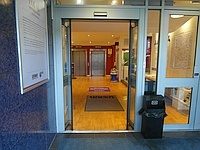 You are on Outside Access (Main Entrance - Level 1). Skip to the next section. 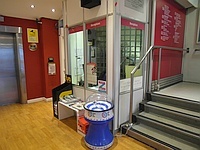 This information is for the entrance located at the front of the building, on John Street. 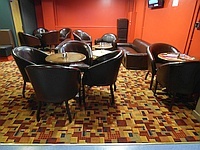 You are on Level Change (Main Entrance - Level 1). Skip to the next section. 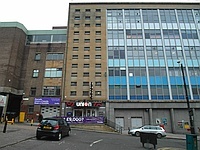 The ramp or slope is located to the left as you face the entrance, towards the direction of Catherdal Street. 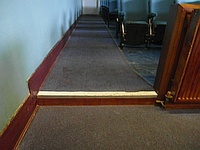 The width of the ramp or slope is 103cm (3ft 5in). 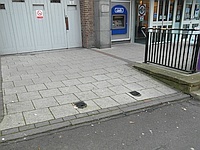 The step(s) is / are located to the right of the entrance as you face it, towards the direction of Cathedral Street. 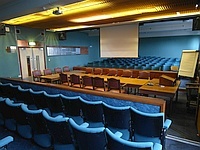 The hearing loop is fitted in the Debates Chamber on level 6. 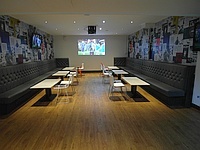 The photographs show the level 5 lounge. 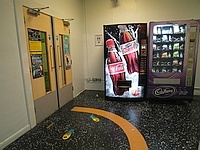 There are refreshments machines available near the lifts. 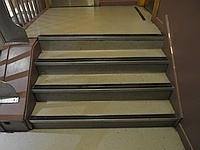 The floors which are accessible by stairs are 1-2-3-4-6-8. You are on Lift (Evacuation Lift - No 131). Skip to the next section. 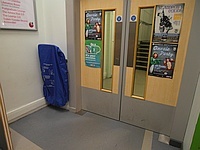 The lift is located at the far end of the entrance foyer. 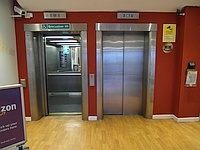 The floors which are accessible by this lift are 1-2-3-4-6-8. There are two lifts here. The one on the left as you face them is an Evacuation Lift. 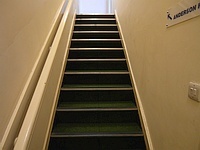 You are on Other Floors (Back Stairs). Skip to the next section. 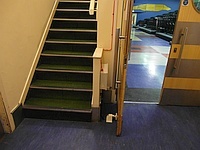 The floors which are accessible by stairs are 5-6-7-8-9-10. 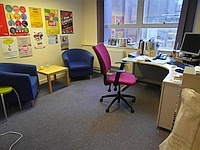 The services on other floors which are not accessible include the offices on levels 9 and 10, including the Cash Office, Central Services Department, Communications Department and the Director of Music. There are between 7-15+ steps between levels. You are on Lift (Lift to Levels 8-7 and 6-5). Skip to the next section. 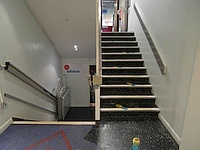 The lift is located on the back stairs on level 8. 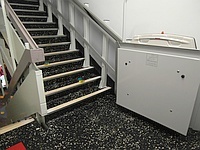 The floors which are accessible by this lift are 7-8. The lift is 7m (7yd 1ft) from the lifts. 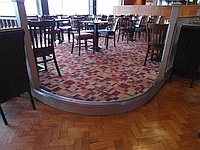 The dimensions of the lift are 81cm x 100cm (2ft 8in x 3ft 3in). 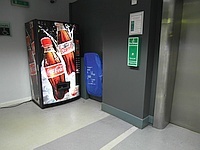 A key is required to use this lift, available from the reception desk on level 1. 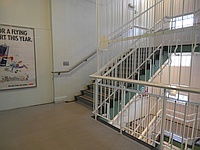 There is an identical lift on the back stairs on level 6, to access level 5 (shown in photograph 2). You are on Advice Hub - Level 5. Skip to the next section. 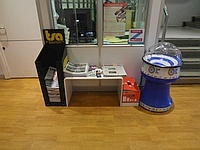 The advice hub is located to the rear right of the level 5 lounge. 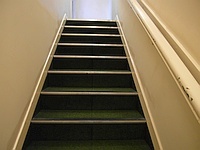 It is 17m from the level 6-5 stair lift which provides level access. 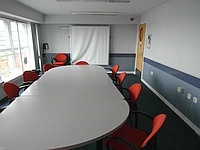 There are several meeting rooms, each with plenty of space. 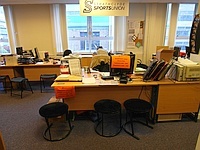 You are on Reception (Sports Hub - Level 7). Skip to the next section. 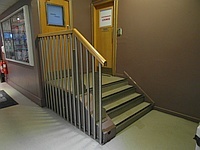 The desk is 12m (13yd 4in) from the 8-7 stair lift. 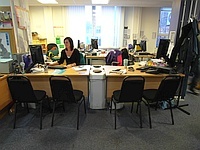 The desk is not generally staffed. 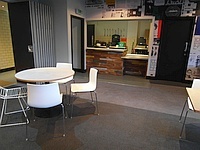 You are on Reception (Student Activities Reception - Level 7). Skip to the next section. 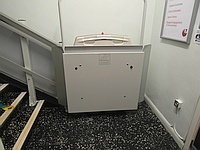 The desk is 15m (16yd 1ft) from the 8-7 stair lift. There are computers available in this area. 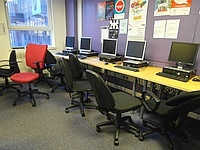 There are height adjustable chairs, some with armrests available. You are on Debates Chamber. Skip to the next section. 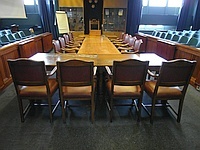 The Debates Chamber is located to the left of level 6, opposite The Priory. 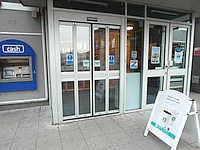 It is 21m from the lift which provides level access. 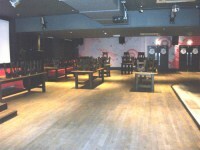 None of the central tables or chairs are fixed. 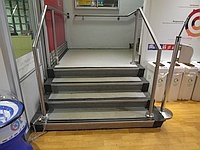 There is adequate room for a wheelchair user to manoeuvre. 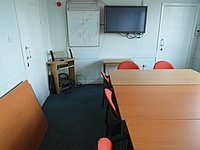 There is a hearing loop fitted in the room. 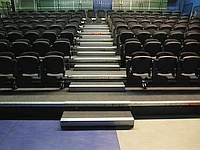 There is 1 clearly marked medium step to access gallery seating. 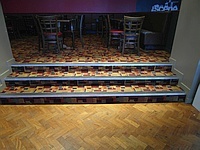 The step is followed by a moderate ramp to rear seating. 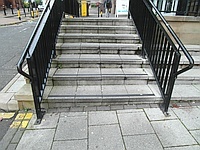 There are no handrails for the step or ramp. 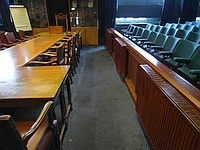 You are on Level Change (Level 6 - Rear of Debates Chamber). Skip to the next section. The step(s) is / are located to the left as you exit the lifts. 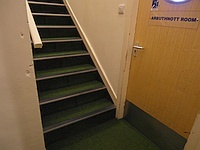 These steps give access to the Postgraduate Common Room and the rear of the Debates Chamber. 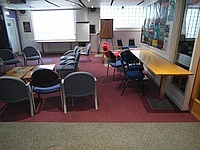 There is level access to the front of the Debates Chamber via the Priory Cafe Bar. 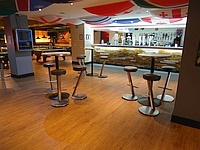 You are on Restaurant Bar Internal (Barony Bar - Level 2). Skip to the next section. 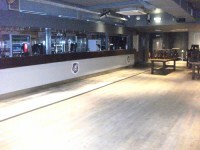 It also contains a dance floor area. 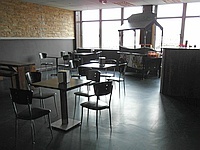 You are on Restaurant Bar Internal (The Yard - Level 3). Skip to the next section. The nearest table is 12m (13yd 4in) from the lifts. 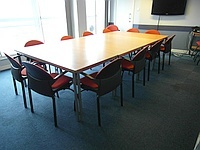 The distance between the floor and the lowest table is 65cm (2ft 2in). The type of food served here is bar snacks. 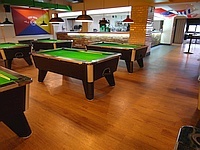 It contains pool tables and games machines as well as a bar and seating. 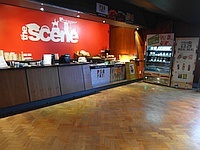 You are on Restaurant Bar Internal (The Scene - Level 4). Skip to the next section. 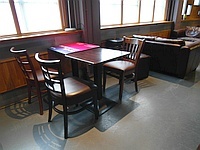 The nearest table is 7m (7yd 1ft) from the lifts. 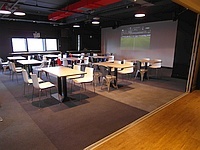 The type of food served here is breakfasts, main meals and snacks. 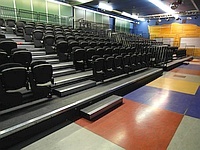 The Scene also contains raised seating areas, accessed by 1 or 3 clearly marked steps with no handrails. 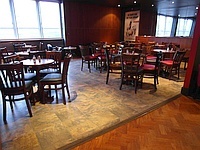 You are on Restaurant Bar Internal (Priory Cafe Bar - Level 6). Skip to the next section. 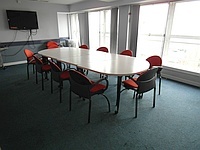 The nearest table is 15m (16yd 1ft) from the lifts. 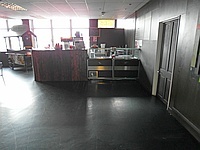 The type of food served here is hot and cold snacks and meals. You are on Eating and Drinking (Taco Mazama - Level 6). Skip to the next section. 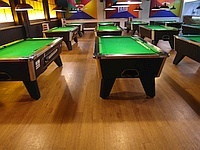 The nearest table is 14m (15yd 11in) from the lift. You are on Vertigo Bar and Venue - Level 8. Skip to the next section. 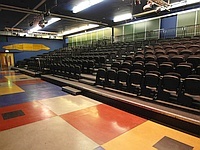 There is retractable tiered seating, with space for wheelchair users at the front. 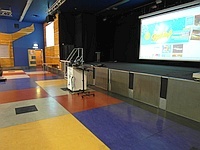 This is used for lectures, exhibitions, conferences and fairs during the day, and live music events and entertainment at night. The bar in Vertigo does not contain a lowered section. There are clearly marked medium height steps with no handrails leading to rear seating. 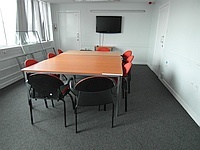 You are on Level Change (Level 8 Meeting Rooms). Skip to the next section. The step(s) is / are located next to Vertigo. There is / are 14 step(s) to the area / service. 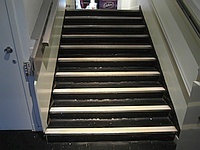 These stairs access the Anderson room. There are similar stairs on the far side of Vertigo from the lifts, which access the Hills Room. 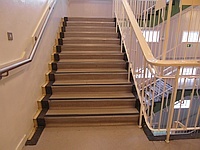 The further stairs have the handrail on the right, but it does not cover the bottom 3 steps (shown in photograph 3). 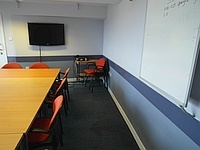 You are on Arbuthnott Room. Skip to the next section. 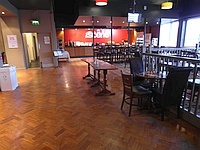 The room is located to the left of level 8. There is level access on this room via the main lift. The room is 12m from the lift. None of the tables or chairs are fixed. All of the chairs have armrests. 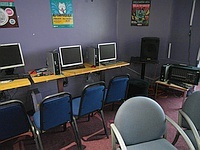 The room does not contain a fitted hearing loop. You are on Anderson Room. Skip to the next section. There is not level access on this room. 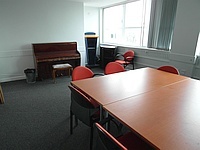 The room is accessed via the level 8 steps. 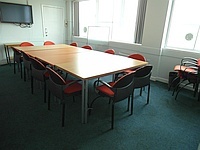 You are on Curran Room. Skip to the next section. 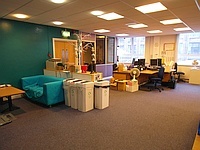 The room is located to the rear left of level 8. The room is 76m from the lift. 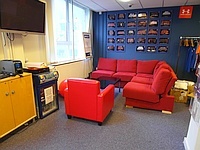 You are on Hills Room. Skip to the next section. 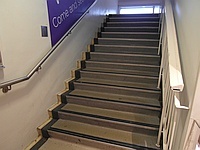 The room is accessed via the rear level 8 steps. 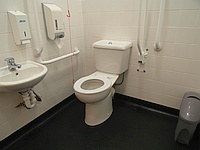 The accessible toilet is 9m (9yd 2ft) from the lifts. 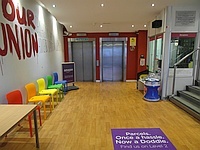 The accessible toilet is located in the toilet area to the right as you exit the lifts. There is an identical toilet in the same location on level 4. You are on Accessible Toilet (Level 6). Skip to the next section. 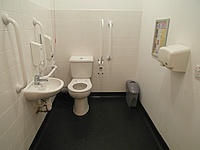 The accessible toilet is 7m (7yd 1ft) from the lifts. 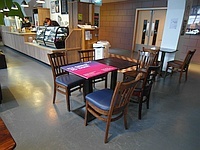 The accessible toilet is located to the left as you exit the lifts, outside the Priory Cafe Bar. 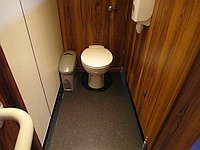 The dimensions of the accessible toilet are 154cm x 180cm (5ft 1in x 5ft 11in). This cubilcle contains a Clos-O-Mat toilet. The toilet seat is height adjustable. The female and male toilets are located on level 3, right as you exit the lifts. The female and male toilets are 8m (8yd 2ft) from the lifts. 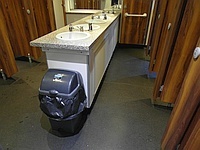 These toilets contain cubicles with grab rails fitted and doors that open outwards. 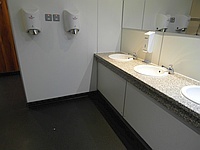 There are additional standard toilets located on levels 2,3,4 and 6. There are unisex toilets located on level 6. 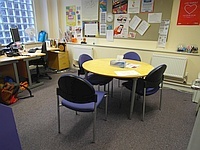 Disability Equality training is provided for Clubs and Societies and Student Engagement staff. At the time of the survey not all bar staff had received this training. There are refuge points next to the Evacuation Lift on levels 3, 4, 6 and 8.